Initially the artists’ inspiration lay almost exclusively in the beauty of the scenery, and the resulting art was concerned with their individual conceptions of beauty. Beauty is the key in our understanding and appreciation of their art. Seldom are these landscapes transformed by extravagant style and fantasy. There is no evidence of surrealism or the angst induced by the Depression and the World Wars. They are idyllic documents of specific places that endure in similar form or have passed, filtered through the perceptions and technical capacities of the artists. In the late 19th and early 20th centuries a number of artists of traditional inclination – people such as Archibald Collins (1853-1922) and Gustav Barnes (1878-1921), who were both born in England, and Harold Septimus Power (1878-1951), who was born in New Zealand – brought with them the necessary cultural capital to succeed in a provincial city, as it was then. A close look at the paintings here by them and H. P. Gill (1855-1916), George Whinnen (1891-1950), Arthur d’Auvergne Boxall (1895-1943), Travis Webber (1900-1968), Rose Lowcay (1889-1968), Tasman Fehlberg (1912-1971), and Robert Waden (1900-1946) indicates the quality that existed outside the more illustrious Hahndorf clan. Indeed, Collins and probably Gill were teachers of Hans Heysen. If Gill, as the late artist Ruth Tuck once claimed, was our first modernist,[ii] her father’s first cousin Marie Tuck (1866-1947), who was raised at Mt. Torrens, was our first home-grown modernist, working in her French-influenced, post-impressionistic method. Her work shown here reveals a flair for depicting people in country scenes. Later Rex Wood (1908-1970) and his brother Noel (1912-2001) developed individual styles that leaned on cubism and expressionism respectively and were some of the most stylistically radical practitioners of their era. Kathleen Sauerbier (1903-1991) moved around the Southern Vales with her painting partner Horace Trenerry (1899-1958). [iii] Both painted in a complementary manner that evoked regional qualities of light and, in many cases, dry ground and air. They were the painters here who bridged the traditional and a more modern disposition in their landscape painting. 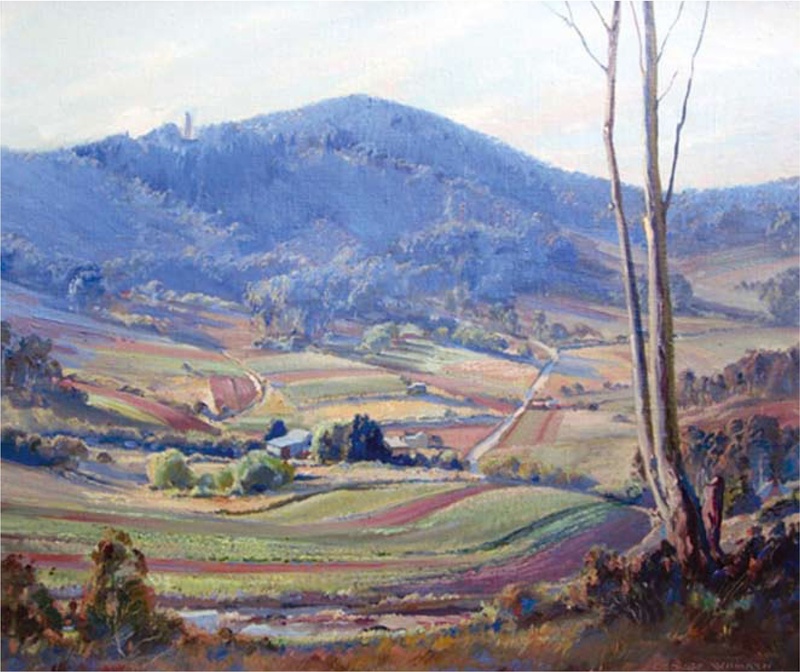 Trenerry is now seen as SA’s greatest landscape painter of the first part of last century, after Hans Heysen. The high modernists began a long infatuation with the Hills’ districts: Dorrit Black (1891-1951), applied the brand of cubism she acquired in southern France upon her return to Adelaide in 1938, and David Dallwitz (1914-2006), and later Geoffrey Brown (1926-) and Geoffrey Wilson (1927-) all painted their transforming environments, and like Black were attracted to depictions of human activity and intrusion into that idyllic sphere. This marks a significant departure from the romantic painting of the traditionalists. All these artists’ approaches to landscape painting are confluent in their tendency to render their panoramas in flattened planes of colour. [iv] Rex Wood also falls stylistically under the “Black” umbrella, as does English-born Ivor Francis (1906-1993), one of the first catalysts of subjective modernism in South Australia, who lived at Crafers for many years and painted numerous scenes of the district. [v] His art diverges markedly from the examples of mystical landscape shown here produced by another of his mentors, Mary Packer Harris (1891-1978). Francis Roy Thompson (1896-1966), who moved to Adelaide from Melbourne in 1948, loved painting the Hills and spent the last years of his life wandering the between Littlehampton, Mt Lofty and Hahndorf and frequenting this very gallery on visits to Walter Wotzke (1917-1996), the watercolour painter who instituted the gallery at this venue. Thompson’s art began in academic fashion, but soon leaned on post-impressionism and then a freer kind of expressionism. [vi] His painting embodies a distinctly different approach to what had preceded it, with the exception of the eclectic explorations of Douglas Roberts (1919-1976), Noel Wood, and later the post-war migrant artists and Toni Graham (1936-2007). This exhibition provides a rare glimpse of a specific region (broad as it is, stretching from the Barossa Valley to the Southern Vales) and an era in South Australian art, when traditional approaches were becoming tainted by modern means. It also invites us to engage with a number of artists, some of whom unfortunately have slipped a little into obscurity. Perhaps this exhibition will perform a great service to South Australians in terms of stimulating respect and a more enduring celebration of these people. [i] Jane Hylton. Nora Heysen: Light and Life (Kent Town: Wakefield Press, 2009); see also Jane Hylton & John Neylon, Hans Heysen: Into the Light (Kent Town: Wakefield Press, 2004). The series deals with artists represented in the collection of Carrick Hill. [ii] The author recalls this comment from an exhibition opening speech, c.1993. [iii] Betty Snowden, A Fleurieu heritage: Kathleen Sauerbier and Horace Trenerry ([Adelaide]: Fleurieu Biennale Inc., 1998). Trenerry has recently been celebrated with a solo exhibition at the Art Gallery of New South Wales, and will shortly be the subject of a new book. [iv] Their work has been featured in publications associated with the Art Gallery of South Australia (Jane Hylton, The Painted Coast, 1998) and the Fleurieu Heritage exhibitions (Jane Hylton, Orchestrated Vision: the Art of Geoff Wilson, 2000; John Neylon, Open Borders, 2004). [v] See Ivor Francis, Goodbye to the City of Dreams: an autobiography (Adelaide: Art Gallery of South Australia, 2004). [vi] Adam Dutkiewicz, Francis Roy Thompson (Adelaide: Royal SA Society of Arts, 1993). [vii] Adam Dutkiewicz & Gaynor Sadlo, Alexander Sadlo: Experimental Journey – an artist in three countries (Adelaide: Moon Arrow Press, 2007). Aside | This entry was posted in Australian art. Bookmark the permalink. Reblogged this on The Dutkiewicz archive.